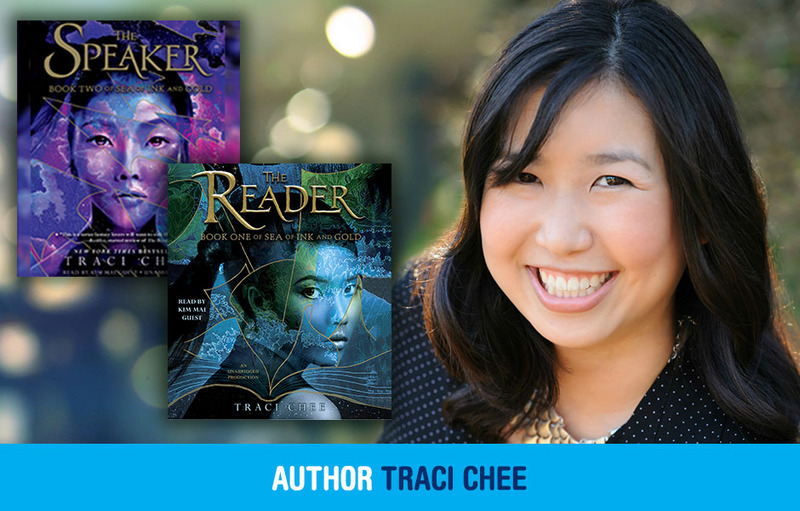 Traci Chee is a self-described “word geek” who, according to her author bio “loves book arts and art books.” So it should be no surprise to anyone that she had plenty to say about the art of audiobooks; her second book is called The Speaker, after all! Keep reading to hear what it was like for Chee to experience her own bestselling series in the audio format, how listening alters the way her words affect her, and why she thinks the audio editions shine a light on the heart of her series in a particularly poignant way. I loved books even before I could read them. I loved the creak of the spine. I loved turning the pages. I loved listening to my mom read Alexander and the Wind-Up Mouse, complete with the voices. I didn’t have to read the words to know that I held in my hands something miraculous and alive. The Reader and The Speaker, the first two installments of the Sea of Ink and Gold trilogy, are in many ways my love letter to books—to paper and ink and glue, to the magic of it all. They are, after all, books about books, about the magic of the written word and the power of literacy. It’s reflected in every detail of their design, from the texture of their deckled edges to the fingerprints in the margins. But when Kim Mai Guest reads the books of Sea of Ink and Gold, they become something else. Gone are the maps, the inked-out paragraphs, the burned pages. When The Reader and The Speaker are read aloud, they aren’t books about books but stories about stories. You see, the world of Sea of Ink and Gold is a world without reading or writing. In this world, people’s deeds aren’t recorded in history books. Their names aren’t carved in headstones. The greatest and most enduring honor is to be remembered, to have your story told again and again and again, so many times no one will ever forget you. It’s a world where stories are exalted above all else, and storytellers are revered for their ability to bring legends to life. When The Reader and The Speaker are in print, you recognize the connections to the written word, to the links between literacy and power. But when you’re listening to it, it’s as if you’re taking part in the books’ own tradition of storytelling. Guest is an unbelievable narrator—listening to her is like wading slowly into the deep pool of this world until you’re fully submerged in it and somehow, marvelously, still breathing. (And she does the voices!) When she speaks, it’s as if you’re more than just an audience member. It’s as if you’re a living part of the story—the long succession of storyteller and listener that goes on and on for generations. You are actively being invited to remember this story…and repeat it. Remember this story, Guest seems to say. Remember Sefia’s discovery of her own power as she struggles to save the people she loves. Remember Archer’s cycles of the loss and recovery of his own sense of humanity. Remember Captain Reed’s journey to the edge of the world, the choices he had to make (and not all of them right), and how that changed him forever. Whatever strikes you, moves you, transforms you, remember it…and pass it on. To remember and repeat. That’s the charge given to every character in Sea of Ink and Gold, and as Guest gives voice to these words, I realize now that it’s also the charge given to you—to us—the readers, the listeners, and now, hopefully, the speakers. To remember what’s happened to us, what’s touched us or challenged us, what’s forced us to grow into the people we are…and to repeat, so those stories will never be forgotten.